Onehunga line trains will skip Greenlane and Remuera stations. This is said to be to speed up services enough that it frees up a 3-car train. From what we hear, what won’t be included in this timetable change is any improvement to frequencies, which is desperately needed off-peak and weekends, especially in the South where the new bus network has already been implemented. The issue of train speed is something we’ve talked about a lot recently, such as Stu’s excellent post on the economic benefits of speeding up our trains, and a guest post on how our trains are slower than even steam trains used to be. I want to focus on it again in this post. If you recall, when we moved to electric trains Auckland Transport actually slowed down the timetable. They padded it out to make the punctuality results look better, especially as the old diesels started to break down with increasing frequency. Following the initial services that were converted to electrics, there also turned out to be a number of issues with the signalling system, other infrastructure and operations (such as dwell times), which prevented trains from being as fast as they should. In July 2015, Auckland Transport released a report outlining all of the work they intended to do to improve train reliability and speed. From what I understand, not all of it was eventually implemented, for a variety of reasons. However, much of the work they did do has contributed to the record highs we currently experience for punctuality and reliability. In the 12 months to the end of December, 98.6% of all trains arrived at their final destination and 96.5% of those did so within five minutes of the schedule. That’s up from lows in mid-2015 of round 96% and 83% respectively, and some individual months were considerably lower again. Train Run times on the Southern and Eastern Lines with electric trains will be shorter than previous pre-electronic train control system (ETCS) signalling with diesel trains, with equivalent times on the Western Line due to large number of rail level and pedestrian crossings and speed limits at these crossings. We’ll have to wait to see just how big the speed improvements will be, but we’re hearing they aren’t significant – perhaps a 3-4 minute improvement on the current timetable at best. If correct, then in our view that’s simply not good enough. And if that is the case, AT’s lack of action mean serious questions need to be asked by those charged with overseeing and managing the organisation, especially seeing as the train network has been all-electric for over 18 months now. Also remember that speeding up services was something the council recently outlined as a key expectation of Auckland Transport. But just how fast should our trains be? We’ve made plenty of our own estimates in the past, so with this post I’m going to look at some official estimates of what should be achievable. The data for this comes from a document I was given by the EMU project team in early 2013. The document includes a lot of detailed technical information from train manufacturer CAF, such as acceleration and braking profiles. Importantly for this post, it also includes modelling just how fast the trains should be. In fact, it goes further, showing how CAF’s proposal compares to the original requirement from Kiwirail (the government initially put Kiwirail in charge of the EMU tender but it and the team were later transferred to AT). The modelling shows exactly how fast both Kiwirail and CAF say the trains would be between stations, including dwell times. For the Western and Southern lines, the modelling includes trains stopping at Parnell, while for the Southern and Eastern lines it includes stopping at Westfield. Onehunga times weren’t included in the part of the document they provided me. For the purposes of this post, I’m only going to show the times listed as being Kiwirail’s Requirement, but in all cases, CAF estimated their trains would be up to about 30 seconds faster over the entire journey. The modelling is also done for each direction of each route, but for the purposes of this post I’ll just list the times to Britomart (the differences in direction are minor). First up, I’ve replicated the tables from the documents. One of the things that immediately stands out is that with the exception of Newmarket, all stations are expected to only have a 30 second dwell time. Even off peak at a quiet station, AT can’t achieve that kind of time. Newmarket is expected to have a 1-minute dwell for Southern line trains and a 2-minute dwell for Western line trains. That’s fairly detailed, so next I cut the results down to compare them to our current timetables, remembering that current timetables are rounded to whole minutes. It’s also worth noting that on the current timetables, the Southern and Eastern lines have a two minute variation in travel times. In both cases I used the lower of the two. Now I appreciate there’s always going to be a difference between some modelled results and what can be achieved in real life, but the difference between the current timetable and what was required of tenderers is, as Trump says, yuuuge. In fact, the savings are so big they’re CRL sized – in the info published by AT about the CRL, they list New Lynn to Britomart as improving from 35 minutes to 27 minutes. Under the required times from Kiwirail above, which don’t include the CRL and include stopping at Parnell as well as Westfield, the trip is supposed to take ….. 27 minutes. Or course, that doesn’t negate the time saving benefits of the CRL. These time savings would then stack on top, so New Lynn to Britomart should be as low as 19 minutes post-CRL. Think about what impact that would have on how people choose to get around. A really important advantage of getting speeds close to these required levels is that it would free up more trains, which could then be used to further increase capacity on the network. Or course, with times so much faster, that capacity will certainly be needed for all the extra people that will want to use the services. It’s perhaps worth pointing out that we don’t know what happened along the way of buying the trains, and it’s possible that for budget reasons that AT had to make some compromises in design – but I’d certainly hope not. I imagine there are still a number of improvements that could be made to improve travel times – such as eliminating level crossings on the Western Line – but in my mind, the biggest opportunity is improving our horrifically slow dwell times. That will likely require a mix of both physical and operational changes. Coming back to the question of how fast our trains should be, I think that if we could get within 2-3 minutes of what was originally expected (and remember CAF said their trains would exceed those times), then I suspect we’ll be doing well. Good work on highlighting the scale of AT’s incompetence on this issue. It just seems mad that we would spend a billion dollars on electrification only to end up with slower trains. The speed or lack thereof can be directly attributed to dwell times (doors) and ETCS, (the trains reaction to signalling that is beyond driver control). Those aren’t reasons they’re *problems*. It’s AT’s responsibility to fix those problems. Other modern trains don’t require so much dwell time. ETCS is used efficiently across the world. One of the drivers has told me that on current timetable he never gets above half throttle so as not to run early. Even now my 0558 from Britomart arrives at Britomart at 0604 (timetable 0606) so that shows the possibilities from using installed power instead of just meandering along. I’ve always said that a saving of 10 minutes would be possible on the Southern if the drivers were allowed to get the best out of the trains. Dwell times, of course, are a whole different ball game. One of the drivers has told me that he never drives at more than half throttle so as not to run early. I’ve always said that a saving of 10 minutes on the Southern would be possible if the trains were allowed to be driven the way they are supposed to be. Dwell times are a whole new ball game. Some of the TMs are getting worse not better. Just having the doors open automatically would save 30 s I guess. I ask at from time to time. The reply comes down to safety. So far I don’t know what that means? People standing in the way of the door.
? where is the problem in that? Actually people standing in the way of the door is part of the delay, as it often looks like they are leaving and then they don’t move, deep sigh. Provided that the train has come to a stop and the door opens to the platform, it should be perfectly safe. I commuted for several years on the Montreal subway. All doors just opened at each stop. No safety issues at all. Maybe they could upgrade to the British Rail doors that you open with a handle and swing them out. Last person on has to slam it shut. People on the platform knew to stand clear. Certainly the fastest way to get on and off, but unfortunately not everyone stood clear – see http://www.nrm.org.uk/ourcollection/posters/CollectionItem?objid=1978-9706&pageNo=4&ipp=48. “A moment’s impatience, a lifetime of remorse” is a slogan that has stuck in my brain. The good part was the had more than one or two doors per carriage so at peak times the trains unloaded and loaded at a real clip. You also got to sit in a compartment Reginald Perrin style. Just shows how automation can make things more expensive and slower. The worst thing is that there are some really obvious things that AT could do that would help enormously. Door pre-ordering is the obvious one. +1 Yes this a key “easy” thing that should be done & won’t cause issues with losing cold/heat cabin temperature through unnecessary door openings. This issue has been thrashed around on this blog before a fair bit. Additionally, if you’re the one waiting to do the button, you almost feel the pressure to do it as soon as possible so as to not hold the train/people up! One weakness in this is people boarding but not alighting from a particular door…hmmm….if it’s not the extendable ramp doors, then it probably won’t matter though. I think dwell times are the biggest concern on trains at busier times of the day, these generally have people alighting through all doors. I don’t think it would matter too much if there was still a small delay on quieter trains, where there might only be someone boarding through a particular door. Yes good point, or peak times extendable ones could all be opened automatically may give a similar result. It’s not just speed but consistency that’s needed to run the ship tight I guess. I timed a couple of stops on Onehunga line the other weekend (around midday anniversary weekend Sunday going in, I think Ellerslie & Remuera) and they were both 35 secs from train stop to start moving again….then we had to wait for slot at Newmarket anyway… probably because that train was actually 7-8 mins late to start with due to a “driver staff” issue. I’m guessing trying to make the stop fast when it’s running late and shows it is possible even with current setup. Looking at the tables, you can see that a lot of the times are just rounded up to the next minute on the actual timetable, but some of them are way over. For example, what happened to Puhinui? 3:08 vs 6:00. I hope AT can sort this out eventually, the trains feel so nice and fast, but the dwell times are ridiculous. Have doors open automatically or on prerequest (although that might require changes to the trains, not sure). Newmarket to Britomart is even worse, 4+ minutes compared with 8, so 3+ minutes of slack built in. This may be to allow punctual arrivals, but if that’s the case why do Eastern Line trains get less than a minute’s slack from their penultimate stop, and is their punctuality significantly worse because of this? The table seems to say 7 mins running time Newmarket to Britomart (not including Dwell at Parnell). You’re right – I got confused by the times beside Britomart being from Parnell in the first (required) column, from Newmarket in the second (current) column, and are therefore not comparable. Interesting that Southern trains are modelled to be 7s slower than Western ones Newmarket-Parnell, but 11s faster Quay Park-Britomart (with the Eastern line slower 27s slower into Britomart than the latter). Wonder why? Or, the other Westfield… except it literally only serves train staff… or, the non-muggles. Was it really that challenging to walk from Puhinui to Wiri? (Not sure what the distance is, it doesn’t seem far from the train.) Counter-argument: was it really so hard to figure out how to manage Southern and Eastern line use of Puhinui (if you don’t stop for a crew change, you stop for a junction). What’s so hard with pre-request? Buses manage it all the time. That’s just asking the driver to stop, who then will open the door for you. Overseas, in trains and especially in trams you press the door button in advance, which will then stay lit to indicate that it’s been requested and that particular door opens automatically as soon as the doors are unlocked. Not sure how hard it would be to modify our trains accordingly. In buses, the button is to alert the driver to stop. Trains will still stop at stations regardless but prerequesting means the doors open as soon as possible compared to the current situation of having to wait for the button to light up and then pressing it. Surely it’s just a software tweak. Two “greens” required to open – one driver, one passenger, currently in that sequence. Can’t believe it is impossible to simply reverse the software logic between the two; the driver still functions as the in-charge approval needed, i.e. no reduction in safety….? Currently for driver read TM, but that’s how the system works now, isn’t it? The TM releases, the passenger opens. No. Driver releases, TM closes. Right (must have been thinking of Wellington), but still no software tweak required. I spent the summer in Perth and used the trains there quite a bit. It startled me how much more efficient the entire system was, particularly in dwell times. Train comes to a stop, doors opened straight away as soon as the request button was pushed, then closed 5-10 seconds later, and then it was pedal to the metal accelerating off the line. And there were a lot of level crossings on the Armadale line which I frequently took so that’s not really a decent excuse either. The train from Armadale to Perth City is roughly 38 km and took only 35 minutes. Yes, the train pattern out to Armadale expresses over part of the line, but the number of stations was the same or more than the number of stations between Britomart and Avondale which is about 10km and takes the same amount of time! In that light, I think there needs to be heads rolling at AT. At the very least, they should be hiring people from Transperth. Transperth is my new role model. 60km/h+ average operation speed is insane. Where exactly is the Parnell station going to be?! In the Waipapa valley between Parnell Rd and Domain, platforms are in, clearly visible from the train if you’re using it…? I’ve seen it when training between Britomart and Newmarket. How would that location make it more accessible for Uni students? Exactly. But a certain Councillor wanted it there so to suit his obsession with re-siting the old Newmarket station building, and nostalgia for now gone old railway sheds… site not selected primarily on passenger utility or network functionality, bit of a dropped pass, sadly. Still with a lot of work on pedestrian connections it still may be ok… not enough sign of these yet however… Hoping that will follow station opening. The footpath from the back of the Carlaw Park student village up to the western platform is out to tender at the moment on a design build basis. Tender closes 20th Feb, so it won’t be done by the time the station opens! So where are alighting passengers supposed to go from the down platform? So as we don’t get ourselves too confused, though it’s downhill from Parnell to Britomart it’s actually Up in railway parlance, so the western (initially inaccessible?) platform is the Up platform. The logic is that Up is towards Otiria (and Down towards Wellington), and thefore towards Britomart on the Newmarket line is the Up direction because the original junction faced south. The good news is that on the CRL, officially an extension of the NIMT, Down will mean downhill! You will have to walk back towards Newmarket, under the underpass from the domain and then back towards the other platform. All because they aren’t providing a bridge for some strange reason. Mike thanks for the railway arcana. I always assumed Down was to the main terminus in the region; not in the whole country! That’s, err, fascinating. So yes I mean the Up platform then (really). And thanks Trundler; that’s nuts too! And just goes to show how little the planning behind this station has been about the university as a likely demand source. So Down is actually Up? Confusing…. Looking at it from a completely basic, solely practical viewpoint of “where would people want to go to” – it would seem that they should have a direct link from Parnell Station across an aerial walkway / pedestrian bridge direct to Symonds St. Not at all practical, of course, in terms of cost and building such a structure, but if you think about it, for people wanting to get off at Parnell (as the closest point to both Universities) then forcing them to go up from the south side of the tracks, and over a (currently non-existent) bridge, down over to the north side, and then walk down Parnell Rise, and along Stanley, and then cross Grafton Gully (or what little remains of it) and then climb up the hill… I know they are mostly students and mostly young and fit etc, but heck: give then a break ! Make it easier to walk the line! That way more people will take PT… Ned a pedestrian foot bridge from Carlaw Park Ave, clear over Stanley St, to Alten Road. That’ll work. Of course, if you (AT) are only thinking of people getting off at to do some shopping in Parnell, then that works fine. But I suspect that not many people shopping in Parnell will want to go there by train…. walking up the hill from the bottom end of Parnell shops etc. Surely it is there to support Kiwirail’s Parnell office, as such it provide for passenger utility and for the network functionality. Trundler, couldn’t pedestrians walk into (one of?) the domain trail(s) and then either head for the Grafton Road traffic lights/the bowling club or take the path that goes through Carlaw? It’s been a while since I’ve been walking in the immediate vicinity but I’m pretty sure that they connect up. I also seem to remember, when they were still building the platform, arriving at some sort of clearing that I thought was pretty much just a line of trees away from the platform. If that’s true, and I am probably mistaken, you could in theory have a middle of the platform set of stairs and a dirt path pretty easily. Trundler,the irony is the old Ontrack wanted the station to be at carlaw park next to where the development is, where the people live, where the university is and where the Kiwirail head office now is. However a certain councillor overruled all the wishes of ontrack and the council, and willfully ignored the advice of the council planners… and forced it to be 400m up the gully in the bush with ideas of some quaint historic precinct. Pure Disneyland transit: create a twee whistelstop station with an recycled station building that looks like some steam age picture book… but totally ignore anyone who might actually use the thing, and ignore how the city might use the thing to support development and improve transport. So now it is 800m walk from the platform to the likes of Kiwirail, when it should be right next door. Eventually they might build and overbridge and some connecting paths to shorten that distance… but it will always be 300-400m up the gully from “civilisation”, so apart from a handful of people catching the train to go on a bush walk it will always be just a little bit far away from anything useful. And they can do something about the slow take offs from red lit platforms such as Avondale, Glen Eden, Baldwin Ave etc by fitting extra ballises further up the platforms for the likes of 3 car units but they just wont do it. Or just move the stopping location of the 3-cars nearer to the crossing? Even if it is all perceptual (ie no change in actual time due to speed restriction in the platform), the impression of a train starting slowly is more impactful than of one arriving slowly. It would also help passenger access in many cases; in Glen Eden the 3-cars stop halfway down the platform, even when probably 80% of passengers enter from the half of the platform nearest the level crossing due to the location of the town centre, buses, park’n’ride. Stopping the train away from the majority points of entrance is just perverse and mildly annoying – but reflects AT’s level of attention to user experience on this front. I wonder if a general over emphasis on Zero Harm is costing seconds at each decision making step? After Pike River, a mining inspector was virtually given carte blanche over KiwiRail’s policies for trains in tunnels. I wonder if something similar is happening with dwell times and the entire Auckland operating process? Is an NZTA/MOT official or officials without international rail experience is setting safety policy for signalling, and for dwell time in general? Should the mayor now order a public enquiry led by a recognised international rail engineering consultancy to review the situation, and recommend the steps needed for improvement? It would be essential for such a review to be have some distance from the AT management team by reporting direct to Auckland Council to ensure independence. At some stage soon, major investment will need to take place in new rolling stock. It is going to be important to ensure that any lessons needing to be learnt can be implemented into future investment into trains, updated signalling systems and general operating practises. Even if AT had the competence to determine what improvements were needed, as it is not a rail safety licence holder ( and has consciously decided that it does not want this responsibility) its ability to influence the detailed operation of trains and signalling is limited at best. 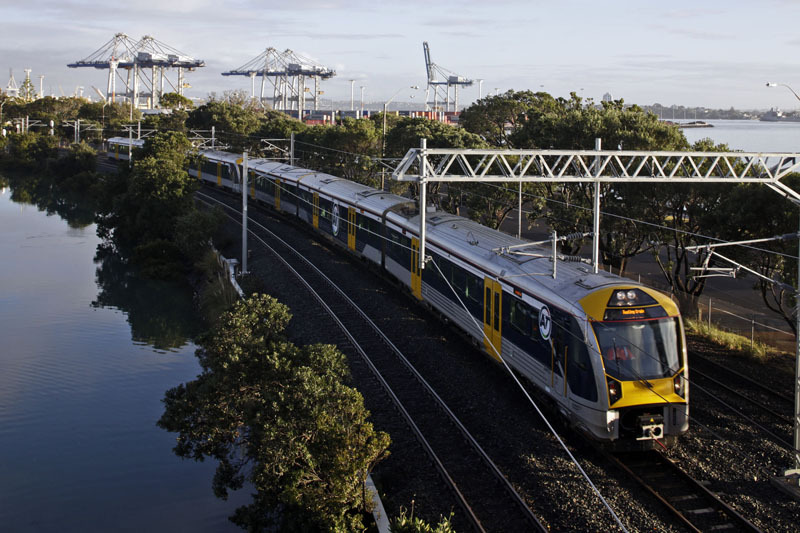 Ultimately there needs to be organisation responsible for all passenger rail operations and infrastructure in Auckland that has the mandate, competence and funding to properly manage and develop passenger services. Possibly the best way to achieve this is via a Melbourne style operations and infrastructure management contract, although if this is not supported by adequate on going government/ council funding for investment and renewals, then problems are likely to continue as has been seen in Melbourne. From observing a number of threads on this over the last year my instinct tells me this is all solvable with the existing trains we have. In the case of dwell times I suspect it is mainly a case of people who are paid to make tough decisions actually making them, I’ve no doubt the trains are fully configurable. In terms of train speeds this may require a bit more investment in signalling hardware, but I also have no doubt the trains can safely accelerate and decelerate much quicker than the currently do, while still being comfortable for passengers on board. Sadly I don’t believe that AT as an organisation has the ability;or perhaps it is the will to fix many of these problems. Because I am from the Shore I only ride the trains infrequently. I have been appalled by the lack of speed and acceleration. And my comparison is with Rio and Santiago, not the express trains of Tokyo and other places. And by all accounts nothing has improved since the new trains commenced and we are now talking years rather than months. AT seems to have an almost complete inability to focus on the detail that is so important. They have appeared to have accepted that buses run on time because their suppliers have told them they do. And the empirical evidence seems to be that very often they simply don’t. Every day I travel on what seems to be counted as part of a rapid transport network; Takapuna town centre (yes a metropolitan centre) to the Civic Theatre. The worst event this week was for the bus to travel 300m in 12 minutes. An acquaintance says that later in the morning that same stretch took him 18 minutes. That same lack of attention to detail by AT. One short piece of the route destroys most of the benefit from the parts of the route that have been completed. I suspect that only by pestering our local politicians are we likely to achieve a public transport system that is acceptable. 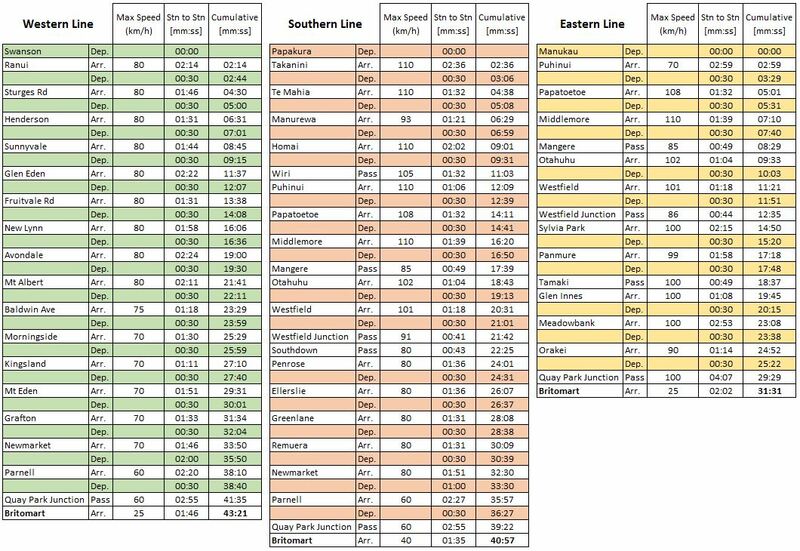 From a couple posts from voice of auckland blog, it appears southern line only speed up from 53 minutes to 51 minutes and no change in frequency. No speed up happens on western line either. This is disappointing and we simply cannot accept this. Last night on the train, aside from the excessive dwell times, I was thinking the acceleration and braking was very slow. The Singapore MRT feels like at least double the force for example. Why weren’t timetables originally made with trains operating to internationally accepted acceleration / braking limits? Those western line level crossings need grade separation. A few minutes saved on the timetable can easily be monetised, along with savings to road users. On the subject of Pike River, a scheduled plan for grade separation now not in 10, 20 or 30 years should also be necessary to meet safety objectives. Comparisons between a 150 year old mixed passenger and freight railway with multiple level crossings and a modern mainly underground metro system like Singapore or Hong Kong are meaningless. Comparing Auckland to Brisbane and Perth is more realistic. Station dwell times can certainly be improved in Auckland both through process changes and the development of a harder nosed less customer friendly approach – I.e not holding the doors open to let a few late passengers onto the train. Holding doors for late passengers also happens in Wellington, but without the excessive dwell-times that Auckland suffers. While this may be a small factor, the real problem(s) lie elsewhere. Having used the trains tregularly on the western line, got to use the southern line on the weekend. To my surprise the southern operates at 15 min intervals! Why not the west? once again us Westies get ripped as only get a train every 30 mins over weekends. Simple change as every train is a 6 car. Also the dwell times and the awful slowing out of stations by crossings is simply appalling management. Let the trains speed up normally, let dwell times be like Sydney… train stops, doors open, 20-30 secs later train moving and fast! The Southern line only operates a 30 minute schedule on weekends. It’s only the bit between Westfield and Puhinui that overlaps with the Eastern line that has higher frequencies. Now, if you do a simple bit of Math, the dwell-times seem comparable… From train stopping, to doors opening, to boarding… All up until when the doors clang shut. From then on, the train in Auckland takes 18 whole seconds before it starts moving. Compared to 6s in Hong Kong. And as far as I know, this lengthy time in Auckland is due to 1 single difference between the trains in Hong Kong, Sydney, Perth, Melbourne. That is, there is no “Train Manager door to be closed”. In Hong Kong, the door is closed by the driver monitoring from CCTVs (same in Perth, I think). In Sydney, Melbourne by the Guard in the guard compartment (who sticks out his head through the window / his/her sliding guard door does not limit the train from moving). It’s only in Auckland that the Train Manager needs to spend precious time to close his door after he/she closes the other doors. A valuable 12s more. If we really want to speed up trains, it’s this “only in Auckland” practice that needs to be changed. It’s certainly not an “only in Auckland” practice. Wellington operates in a similar way, and a huge industrial dispute has been going on for months on the Southern Railway in England essentially about who closes the doors, current practice being basically as here. Well, all right, maybe not only in Auckland, but in New Zealand then. Where the Guard/Train Manager has to close 2 sets of doors before the Train can launch off. The majority of the passenger doors, and then his/her door (which is also a passenger door). In contrast, I really don’t think that this practice exists anywhere else. Not even Southern Railways as you suggested (see video below). The guard has his own compartment; after he closes all the passenger doors, the train can be off. Same as in Sydney, Melbourne, New York, etc,. There are no guard’s compartments on any modern British rolling stock – the person is leaning out of the window of an intermediate driving cab. used to be like that on regional trains in Italy (90’s 2000’s) but usually the train would leave the station with the Train Manager still hanging out of his opened door. You had to be real quick to get on/off sometimes the train would stop for a few seconds only. In a competently managed system an offpeak minor station dwell should be no more than around 25 seconds. In Sydney for example, this is typical: buffer 1, door opening 4, handling passengers 10-15, door closing 4, buffer 3, total 22-27. That is with two-person crews and large plug doors. In Melbourne, usually a little less, as the smaller sliding doors take less time to open and shut. (buffer: the time between when the train stops and the door starts opening and vice versa). I was on a western line train recently where the dwell was 35 seconds for four consecutive stops. Please Phil Goff, get some management in from Australia to sort this issue out. In Wellington the Matangi dwell time is often no more than 30s, in spite of the train manager’s door needing to close separately. On lightly-loaded services, dwell-times can be as little as 15 sec, wheel-stop-to-wheel-start. However my observation is that station-stop performance, just like driving-performance, varies considerably between different train-crews. We have managers from Australia – called Transdev! Although some of the senior railway managers in AT and Transdev are from NZ. Transdev is actually a French company, and operates urban railways all over the world. As far as I am aware, the Transdev contract was designed to be finished by now. I would guess they are incentivised to run ‘on time’. Having new, faster, trains enables them to do this. Why would they want to cut the timetable which will risk the thing they are measured on? We need to move the carrot. Agreed, a new contract need to be renewed to update how KPI is measured – that includes efficiency measures such as speed and frequency. As well as changing from fixed timetable to minimum frequency per hour timetable. Timetables are set by AT who micromanage everything that Transdev do. Disappointing that Eastern line we will save ~1min from Otahuhu to Sylvia Park but then the timetable has just been padded, in fact 1 min slower than before to get to Britomart?! – maybe is more to do with trains clashing with the other lines? New timetable seems to show a 1 extra min consistently from GI to Meadowbank…which is a real speedy section of the line, so seems they will just be running slower through that bit. Orakei to Britomart an extra min too, I would expect we will get very reliable times if this is the case, seem to recall it’s often late around this section? Grant, I too have given much thought to why our trains are so slow. The only answer that I have is that because of the enormous growth in rail passenger numbers there is likely to be a crisis point pre CRL where the current train set is just swamped. Having not put any plans in place for such an eventuality AT has realised they had to do something. Answer – slow the trains down so that they run just as slowly as the buses so that passengers are ambivalent what service they use. Mayor Goff needs to give public transport a good shake,but fix what he can fix. If he then wants an aspirational project build some light metro somewhere. I say it should be to the Shore because the BCR is likely to be the highest and it would save some $4b on a wasteful road tunnel. This money could fix the airport problem.